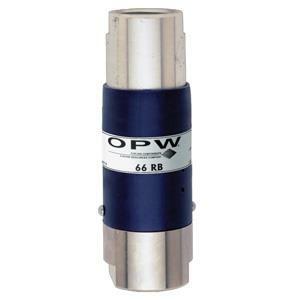 OPW 66RB 1" Reconnectable Breakaway | CSESCO INC. The 66RB-2000 Reconnectable Breakaway is designed for use in today’s truckstop and high-volume markets. Intended for installation on fuel dispensing hoses, the 66RB will separate at a maximum force of 350 lbs. Upon separation, the integral check valves close, stopping the flow of fuel and limiting any fuel spillage from either hose end. For proper operation on high-hanging hoses, the OPW 66RB must always be installed using a “straightening hose” with a minimum length of 12", such as the OPW 66H. For low hose applications, the 66RB should be installed downstream of the retractor cable.